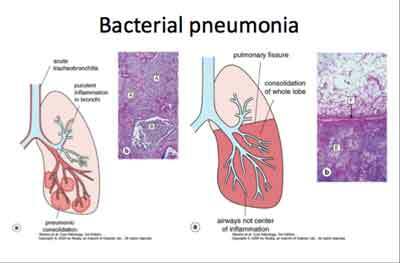 Pneumonia, an infection of the pulmonary parenchyma is a commonly encountered, potentially life-threatening condition in clinical practice. In light of the recent pandemics of multidrug-resistant bacterial infections world-over, pneumonia has been categorized as either community-acquired pneumonia (CAP) or health care-associated pneumonia (HCAP). The subcategories of HCAP include hospital-acquired pneumonia (HAP) and ventilator-associated pneumonia (VAP). In spite of the availability of potent new antimicrobials, CAP is associated with considerable morbidity and mortality, particularly in elderly patients and those with significant co-morbid illnesses. Ministry of Health and Family Welfare, Government of India has issued the Standard Treatment Guidelines for Community Acquired Pneumonia(Bacterial). Symptoms and signs consistent with an acute lower respiratory tract infection (productive cough, rusty sputum, pleuritic chest pain, etc. ); presence of at least one systemic manifestations (either a symptom complex of sweating, fever, shivers, aches and pains and/or temperature of >38 o C or more). New focal signs on physical examination of the chest. New chest radiograph evidence of pneumonic consolidation which is at least segmental or present in more than one lobe and is not known to be previously present for which there is no other explanation. Confirmation of aetiological diagnosis by blood culture/sputum culture and/or molecular diagnostic methods. Estimates form the developed world suggests that CAP occurs in 8 to 15 per 1000 persons per year; the highest rates are at the extremes of age. No systematic studies have been carried out till date to define the incidence of CAP in India and reliable epidemiological data are lacking. Persons hospitalized with CAP who smoke should be counseled regarding smoking cessation. Respiratory hygiene measures, including the use of hand hygiene and masks or tissues for patients with cough, should be used in outpatient settings and casualty as a means to reduce the spread of respiratory infections. The onset of CAP is acute. Patients present with symptoms suggestive of acute lower respiratory tract infection, cough, rusty sputum, pleuritic chest pain, and constitutional symptoms, such as, fevers, sweating, chills, rigors, body aches and pains; temperature of >38 o C or more. Patients with CAP look sick and toxic. New and focal signs of pneumonic consolidation (reduced movements and expansion, increased tactile vocal fremitus, dull note on percussion, tubular bronchial breathing, increased vocal resonance, aegophony and whispering petriloquy; pleural rub) are present on physical examination of the chest. Signs due to complications, such as, pleural effusion, empyema, sepsis syndrome may also be present. Chest radiograph:A chest radiograph is the cornerstone to establishing the diagnosis of CAP or an alternative diagnosis, and to assess the extent of the disease and the presence of complications such as pleural effusion, lung abscess etc. Pulse oximetry: pulse oximtery is useful for assessment of gasexchange status. Sputum Gram’s stain, culture; smear examination for acid-fast bacilli; blood culture. Serum biochemistry (blood urea, serum creatinine, liver function tests). Arterial blood gas (ABG) analysis: ABG analysis is helpful in detecting acute respiratory failure that may complicate the course of CAP. Assessment of severity: This is best assessed by CURB-65 scoring system [confusion, urea >7mmol/L, respiratory rate >30/min, blood pressure (systolic <90 mmHg or diastolic <60 mmHg), Age >65yrs] and guides admission to ICU and antibiotics administration. Pneumonia Severity Index (PSI) a prognostic model to identify those with low risk of death. SpO2 monitoring by pulse oximetry. Adequate circulation and blood pressure is ensured using volume infusion and/or vasopressors. The decision to admit patients with one or more adverse factors (confusion, respiratory rate > 30/min; systolic blood pressure <90 mmHg or diastolic blood pressure <60 mmHg; age more than 65 years) without severity factors (hypoxaemia, bilateral or multilobar involvement on chest radiograph) should be individualized. Patients with one or more severity factors listed above need hospitalization. Admission into an ICU: for patients with septic shock requiring vasopressors or with acute respiratory failure requiring intubation and mechanical ventilation, direct admission into ICU will be required. Admission to an ICU is also recommended for patients with 3 of the following minor criteria for severe CAP: respiratory rate >30 breaths/min; PaO2/FIO2 ratio 250; multilobar infiltrates; confusion/ disorientation; uraemia (blood urea nitrogen level >20 mg/dL); leukopenia (total leukocyte count, < 4000 cells/mm 3 ), thrombocytopenia (platelet count <100,000/mm3 ), hypothermia (core temperature <36o C); and hypotension requiring aggressive fluid resuscitation. When admitted, these patients are treated with intravenous beta- lactam plus macrolide (Table 1 ). Duration of antibiotic therapy is 7 to 10 days based on clinical response. A switch to oral therapy can be made at 48-72 hours as most patients with CAP will have an adequate clinical response within 3 days, which includes improvement in cough and dyspnoea, absence of fever, decreasing white blood cell count and functioning gastrointestinal tract with adequate oral intake. Patient may be discharged on the same day if medical and social factors are favorable. Pleuritic pain should be relieved using drugs such as paracetamol. In patients with hypoxaemia, spontaneous ventilation using a face mask with a high flow gas delivery system can be used to deliver a FIO2 of up to 0.5 to 0.6. The choice of antibiotics for out-patient treatment of CAP is as follows. For previously healthy patients and those who have not used antimicrobials within the previous 3 months, treatment with oral macrolide (e.g., azihtromycin) is indicated. For patients with comorbidities such as chronic heart, lung, liver or renal disease, diabetes mellitus, alcoholism, malignancies, asplenia, immunosuppressing conditions or use of immunosuppressing drugs, or use of antimicrobials within the previous 3 months, and patients in regions with a high rate (>25%) of infection with high-level [minimum inhibitory concentration (MIC) 16 mg/mL] macrolide-resistant Streptococcus pneumoniae, oral treatment with coamoxyclav in combination with macrolide is recommended. Patients presenting with two or more adverse factors (confusion, respiratory rate> 30/min; systolic blood pressure <90 mmHg or diastolic blood pressure <60 mmHg; age more than 65 years) or one or more severity factor (hypoxaemia, bilateral or multilobar involvement on chest radiograph). Patients not responding to therapy. Pleural fluid, if present, for microscopy, culture and pneumococcal antigen detection. Sputum or other respiratory tract specimens (for Legionella culture and direct immunofluorescence) (if available). If available, sputum or other respiratory sample for PCR or direct immunofluorescence (or other antigen detection test) for Mycoplasma pneumoniae, Chlamydia spp, Pneumocystis jirovecii (if at risk). 5.Imaging studies: ultrasonography of the chest is useful for detecting complications such as pleural effusion, empyema. In non-responders, computed tomography of the chest can help in detecting an underlying malignancy and complications, such as, lung abscess. 6.Bronchoscopic procedures: should selectively be used in individual patients for aetiological confirmation and ruling out an alternative diagnosis, such as, malignancy. Patients should be assessed for volume depletion and may require intravenous fluids. Prophylaxis of venous thromboembolism with low molecular weight heparin should be considered for all patients who are not fully mobile. Nutritional support should be given during prolonged illness. Airway clearance techniques should be considered if the patient has sputum and difficulty in expectoration or in the event of a pre-existing lung condition. A beta-lactam (cefotaxime, ceftriaxone, or ampicillin-sulbactam) plus azithromycin are recommended. For penicillin-allergic patients, a respiratory fluoroquinolone and aztreonam are recommended. If Pseudomonas is a consideration, an antipseudomonal beta-lactam (e.g., piperacillin tazobactam, cefepime, imipenem, or meropenem) plus either ciprofloxacin or levofloxacin (750 mg) are recommended. The above beta-lactam plus an aminoglycoside and an antipseudomonal fluoroquinolone are recommended. For penicillin-allergic patients, aztreonam may be substituted for above beta-lactam). Prior to use of respiratory fluoroquinolones, active pulmonary tuberculosis should be excluded. If community acquired methicillin-resistant Staphylococcus aureus is a consideration, vancomycin or linezolid can be added. All patients should receive appropriate oxygen therapy with monitoring of oxygen saturation and inspired oxygen concentration with the aim to maintain PaO2 at 60 mm Hg or above and SpO2 between 94%–98%. High concentrations of oxygen can safely be given in patients who are not at risk of hypercapnic respiratory failure. Oxygen therapy in patients at risk of hypercapnic respiratory failure complicated by ventilatory failure should be guided by repeated ABG measurements. Patients with CAP who develop acute respiratory failure require mechanical ventilation for maintaining gas exchange with minimal complications. Early thoracocentesis is indicated for all patients with a parapneumonic effusion. Patients found to have an empyema should have effective pleural fluid drainage and appropriate antibiotic therapy. Streptokinase may be instilled if loculation(s) present. risk group 1.Oral and i.v. What about ventilation perfusion scan? is there any role of this investigation in ICU admitted patient.